Lightly adapted from Gena Hamshaw’s Power Plates. This recipe is naturally gluten-free, vegan, low-carb and keto-friendly. Trim the stem of the cauliflower so it can rest on a flat surface. Cut the cauliflower into 1-inch steaks. The amount of steaks will depend on the size and condition of the cauliflower. 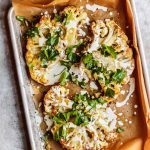 Place the cauliflower on the lined baking sheet and drizzle with 2 tablespoons olive oil. Sprinkle the steaks with a pinch of salt and pepper. Bake for 30 minutes or until the cauliflower is golden brown and fork-tender, flipping once halfway through the baking time. While the cauliflower is baking, combine the remaining tablespoon olive oil with the parsley and pumpkin seeds, and season with salt and pepper. When the cauliflower is done baking, spoon on a hearty amount of lemon tahini dressing and top with the herb mixture.